There were some shepherds in that part of the country who were spending the night in the fields, taking care of their flocks. An angel of the Lord appeared to them, and the glory of the Lord shone over them. They were terribly afraid, but the angel said to them, "Don't be afraid! I am here with good news for you, which will bring great joy to all the people. This very day in David's town your Saviour was born—Christ the Lord! And this is what will prove it to you: you will find a baby wrapped in cloths and lying in a manger." Bret Harte wrote a book entitled The Luck of Roaring Camp. Roaring Camp was supposed to be, according to the story, the meanest, toughest of all mining camps that boasted that there were more murders and thefts than anywhere else. In amongst all the men there was one woman. She died while giving birth to a baby. The men took the baby, and they put her in a box, wrapping her in some old rags. When they looked at her, they decided that it didn’t look right, so they sent one of the men into town to buy a rosewood cradle. When they put the baby in the cradle with the old rags it still didn’t look right, so they sent another man into town to buy beautiful silk and lace blankets. They put the baby in the rosewood cradle and wrapped the blankets around her. They all stood back and admired the baby in the cradle and felt satisfied until one of them noticed how filthy the room was. So those hardened, tough men got down on their hands and knees and scrubbed the floor, they washed down the walls and the ceiling, cleaned the dirty windows and hung curtains. Now things were beginning to shape up as a place fit for a baby. Then they realised that babies need a lot of sleep and so they had to stop the loud talking, arguing and brawling caused by their drunkenness. They had to change their drinking habits. They used to take the baby girl in her rosewood cradle and place her at the mine’s entrance so they could all see her at the end of the day. Then someone noticed what a dirty place it was, so they planted flowers, and they made a very nice garden. And when the miners went to the cradle and the little baby would take hold of their fingers they noticed how dirty their hands were. Very soon, the general store was all sold out of soap and shaving gear and after-shave. Nothing was ever the same again at Roaring Camp … the birth of a baby had changed everything. A baby had touched the lives of each miner and so changed the atmosphere of the whole camp. Today we have come here to celebrate the birth of another baby and his impact on the Roaring Camp of our world. The Bible says that things would never be the same again after the birth of the baby boy of Bethlehem. The angel announced to the shepherds "good news … that will bring great joy to all people" and then the angel; choir sang, Glory to God in the highest and peace on earth to those with whom God is pleased." The birth of this baby wasn’t just for a select few, he was born for all people; he was born to bring peace and joy into the hearts and lives of all people on earth. Because of this one event, in a humble stable, in a tiny town in the back blocks of the Roman Empire, two thousand years ago, the world has never been the same. This birth was no ordinary birth. This baby is no ordinary baby. This baby is God come to earth. This baby, the angel said to Joseph, is Immanuel – God with us. He is God in the flesh; this is God become a human being as had been promised for so many centuries. His name is "Jesus" which means Saviour. God has come to earth to change our world. Our world is so much like Roaring Camp. Sin has taken control of the lives of the people of our world. From the days of Adam and Eve, sin has ruled causing so much pain and suffering in our world. We need only reflect on that one day in this past year that changed our world – I refer to September 11. In disbelief we watched our TV screens as we saw fully loaded passenger planes crash into the sides of buildings bringing them down with the loss of thousands of lives. Fear gripped the world as everyone wondered where this sort of thing would strike next. And then the war in Afghanistan brought fresh fears of retaliation and more destruction. The ongoing tensions in the Middle East have brought more loss of life, more threats, homes destroyed, and the likelihood of all out war. Australia might not be experiencing war but we have our own Roaring Camp. Drugs, murder, sexual abuse, broken homes, crime, you name it – sin is having a field day in our own community. Instead of resisting sin and evil, people are embracing it and saying that what God regards as wrong is actually right and good. Roaring Camp in Bret Harte’s book had nothing on the Roaring Camp of our world today. That’s why God sent his only Son into the world. He wants to save all those who are trapped in sin. And to be our Saviour, this baby of Bethlehem had to die on a cross. He died to bring us forgiveness for all of our sin, and the hope of life forever in heaven. He came to change the world. We are told that God loved the world so much the he sent his only Son that whoever believes in him would not die but have everlasting life (John 3:16). is a beautiful story that captures the hearts of adults and children alike. But this story is not told in the Bible because of it’s fairy-tale like quality and to make us all warm inside. This is a story about God getting serious about sin and its fatal consequences. This is a story about the aching heart of God for his people. This is a story about God rolling up his sleeves, and getting down amongst all the problems of our world and doing something about. This is a story about a baby who was born to bring salvation and rescue to you and me by giving his own life. There is a play that asks the question, "What did Joseph do the day after Christ was born?" It is an interesting question. The day when Jesus was born, of course, he helped Mary with the baby. He did everything he could to make things as comfortable for them as possible. But what about the day afterward? The play imagines that since Joseph is a carpenter, he begins making a crib for Jesus. And as he does, he ponders over what had happened the night before and asks the question, "If they treated him like this when he is just a baby, how will they treat him when they find out he is the Son of God?" At about that time in the play, the lights suddenly go off, and all you can hear is the hammer hitting against the wood. How would they treat him when they found out he was the Son of God? They would nail him to a cross. From the very beginning of the Christmas story the shadow of the cross falls across the manger. Normally when we speak of death at the birth of a baby, our hearts are saddened. But when we speak of the death of Jesus at Christmas our joy is made complete. Jesus died for you and me. He died because of our sinfulness and to give us forgiveness. He died because of his wonderful love for us. He died to give each of us the peace that comes from knowing that our sins are forgiven and the comfort that comes from knowing that beyond death is life in heaven forever. He died to change us – to give us new life, a changed heart that is loving, kind, understanding and forgiving, to live as God designed us to live. That’s what happened in the story about Roaring Camp. The baby changed the lives of each individual miner. They changed their lifestyle, their habits, their behaviour because of the baby. But, you might say, Roaring Camp is a fictitious story, it’s so far from reality. The whole community changed in the story, but look at our world today. It’s in as big a mess as ever. The baby in the manger might have had an impact on individual lives but hasn’t made much of an impact on the world at all. That’s right, sin will always be a powerful influence in our world bringing about all kinds of death and destruction and unhappiness as it has in the past. This is where you and I as individuals come in. God sent Jesus to save the whole world and he has given you and I the special responsibility of ensuring that the baby in the manger changes the lives of more and more people – the people in our families, the people who are our relatives and neighbours, the people whom we don’t know personally but who need to know about the saving love of God. It was the individual miners at Roaring Camp who changed and had a powerful influence on the rest of the camp. Don’t underestimate the influence that God can exert through you to bring about change in your family and in your community. Let the love and forgiveness of the Christ-child be seen in you and others will follow. If your children see in you your faith in Jesus and your love and gentleness and forgiveness, this will be a powerful influence in their lives and bring about a change in the atmosphere in your home. Let the love of God be seen in what you say and do, and this will bring about change among your friends. God came into this world to bring joy and peace to the world. As we sing the carols and reflect once more on the birth of our Saviour, let the love of God bring about a change in you. Let it change you in such a way that everything you do will be directed by the love of God. You are set free from the burden of the past! You become clean on the inside. New desires, aspirations and hope motivate your actions! Let's celebrate the birth of Jesus, the baby who changes hearts, the Saviour who died on the cross, the Lord who lives! We join with the angels and sing Glory to God in the highest because we have our Saviour - Christ the Lord – come down from heaven into this world! 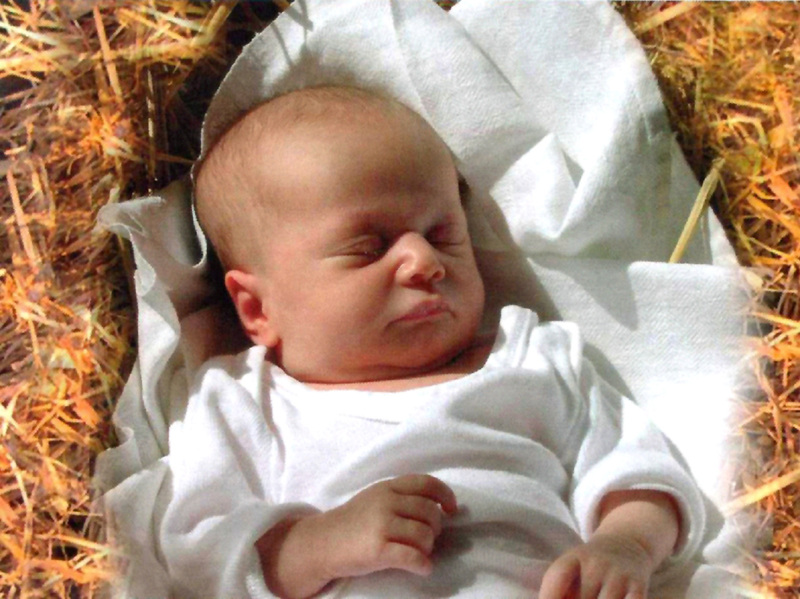 This baby wrapped in cloths and lying in a manger has come to bring God’s peace to all people.